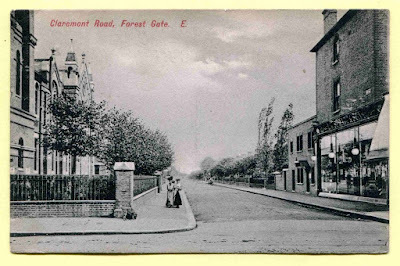 This is the first of a two part article on the history of Emmanuel Church and of the CofE in Forest Gate. The second half, on the rise and fall of the Church of England locally will appear next. There have been literally dozens of churches and religious buildings in Forest Gate over the last 170 years of its existence as a significant community. None is probably better known, or more familiar to today's residents, than Emmanuel church, sitting as it does on the key cross roads of Forest Gate - the junction of Upton Lane with Romford and Woodgrange roads. This is its story, told in two parts - and we are totally indebted to a one-time curate of the church, Andrew Wilson, for being able to retell it. (see footnote for details). 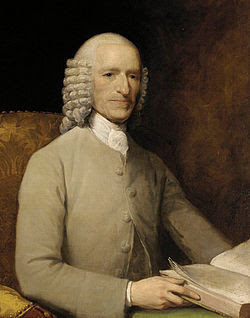 John Fothergill, the Forest Gate botanist (see here for details), planted an acorn on the site of the church, during his residence at Ham House (now West Ham park). 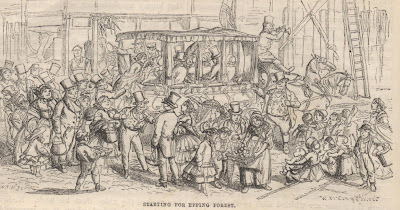 It grew into a fine oak, and was mentioned in the Katharine Fry/Gustav Pagenstecker history of West Ham (see here for details). 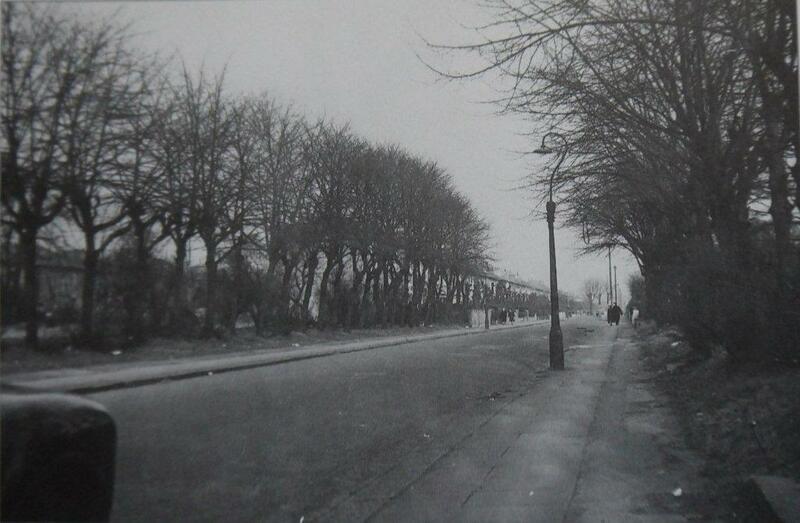 The tree gave Upton Lane the nickname of One Tree Lane at the turn of the 19th/20th centuries. 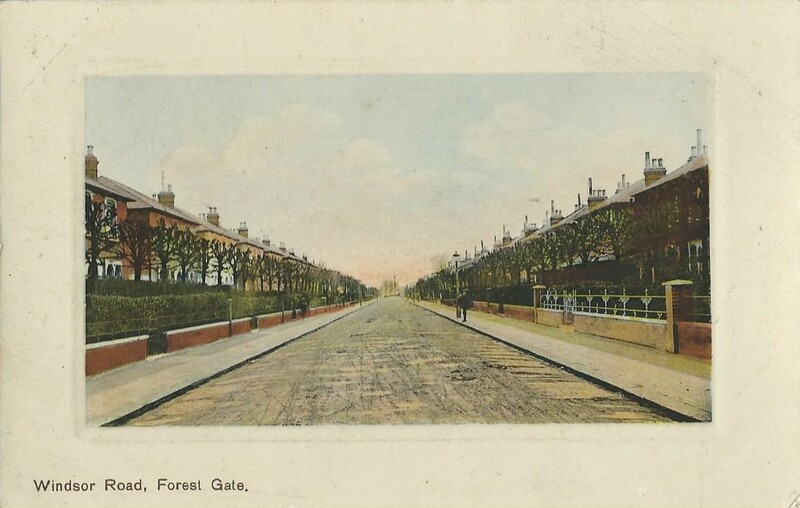 The coming of the railway to Forest Gate in 1840 lead to the beginnings of its rapid population growth. A decade later a decision was made to build a Church of England church in the area, to service its burgeoning community. 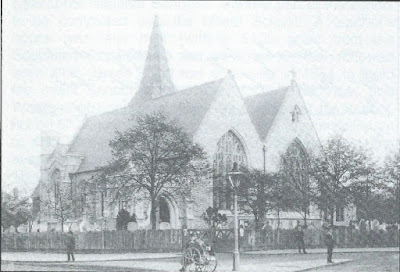 It was originally conceived as a chapel of ease (a sub-church, for those who were unable to reach a more established church - in this case, West Ham parish church) and it was consecrated on 22 May 1852. 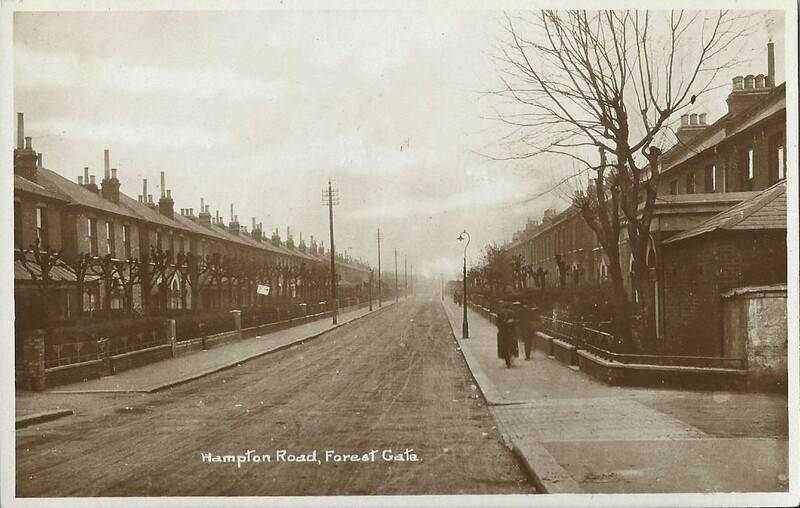 The area to be served by it was from land half in the then parish of West Ham and half in the old East Ham parish. 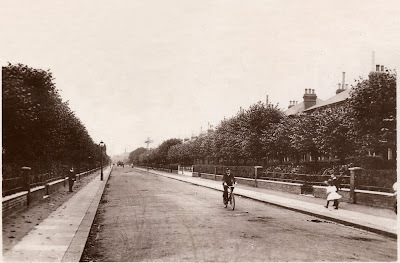 The existing dividing line between the two parishes was along roughly what is Green Street, today. 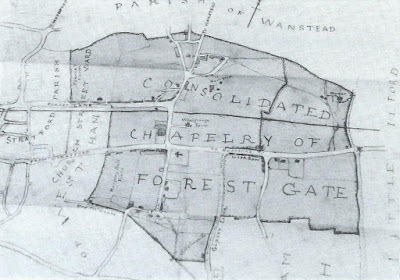 The area covered by Emmanuel church's parish. 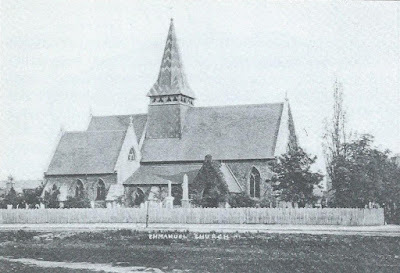 The two parishes paid £50 each towards the establishment of this hybrid church, which was referred to as being a "consolidated chapelry" (because it was carved out of two existing parishes). 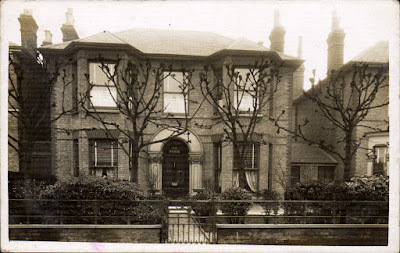 The right to nominate a vicar of Emmanuel alternated between East and West Ham parishes until 1962 - when the church, itself, joined to form a new parish, by merging with St Peter's of Upton Cross (see later for details). 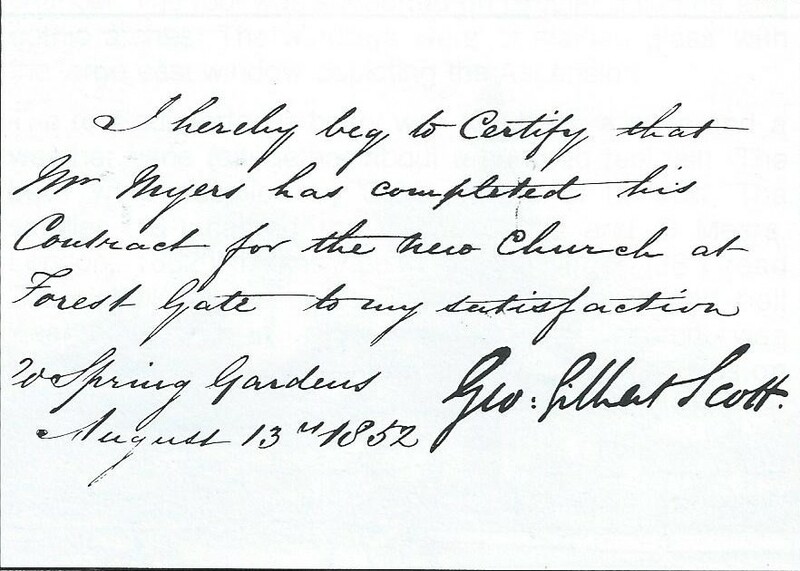 Nomination rights for selecting the vicar then transferred to the Bishop of Chelmsford. 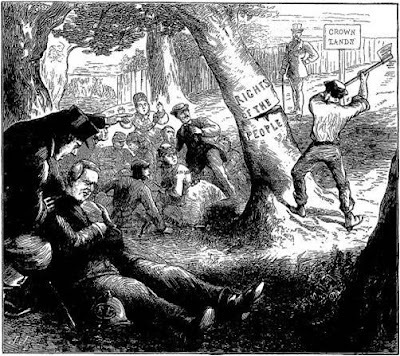 The alternating of vicar nominations process caused problems during most of the 110 years the arrangement operated. Broadly, West Ham church has a "low" church tradition, and East Ham, a more formal "high" church tradition. So, the seeds of the on-going conflict soon became apparent. The territory assigned to the Emmanuel parish (see map) was considerable. 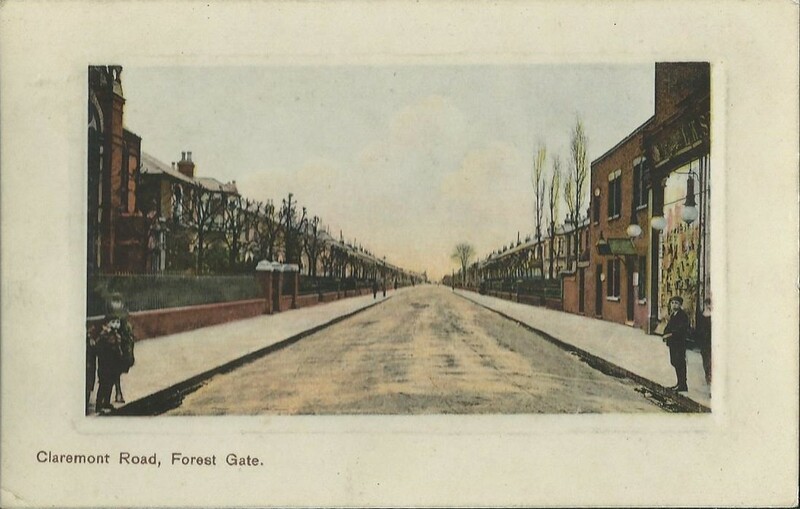 Rapid population growth in Forest Gate led the church, itself, later to spawn "daughter" churches within the parish, to cope with speedily growing parishioner numbers. The Emmanuel parish boundaries extended roughly from Wanstead Flats in the north, to Plashet Road in the south and from Water Lane in the west to High Street North, in the east. Unsurprisingly, pretty much the area we know today as Forest Gate! The "daughter" churches - some of which have not survived - included St Saviour's, St Marks, All Saints and parts of St Edmunds, St James' and St Peter's Upton Cross (see later for details). The original Emmanuel church building cost £4,235 to construct - the bulk coming from the pocket of the Rev Tuile Cornthwaite of Walthamstow. The Church of England Commissioners only supplied £150. The eminent church architect George Gilbert Scott designed the building. It was of an early English decorative style, built with Kentish rag stone and York stone. The original church (it has been subsequently much altered) was built to accommodate a congregation of 500 (see illustration). The titles on the steeple were in two colours - with 'V' shapes. The stripped steeple lead to Emmanuel colloquially being referred to as the 'Harlequin church'. 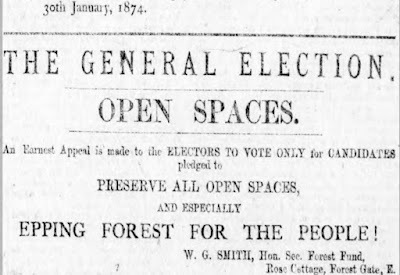 As well as a church, a new school was planned (see here for article on early education in Forest Gate). Samuel Gurney (see here) gave land on the corner of Woodgrange Road and Forest Street for the Emmanuel National school (see here). 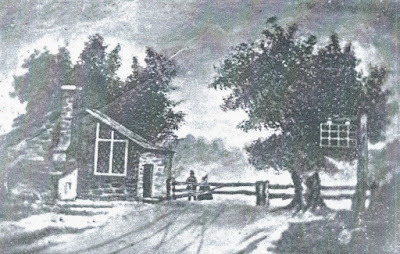 An infant's school followed in 1864. The vicar and wardens of Emmanuel were the school's first trustees - until they passed responsibility on to St Saviours (one of the daughter churches) in 1888. By this time, the school's numbers were in decline, as state run School Board schools proved to be more popular. The Emmanuel school closed in 1894. 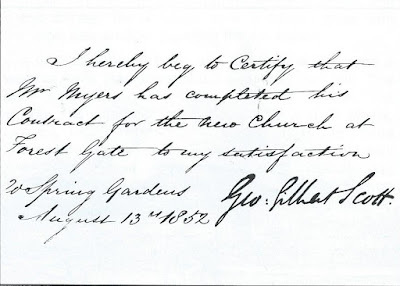 The Gurney family (Quakers) again gave land for a vicarage for Emmanuel, in 1876. It was built three years later, at a cost of £2,480. 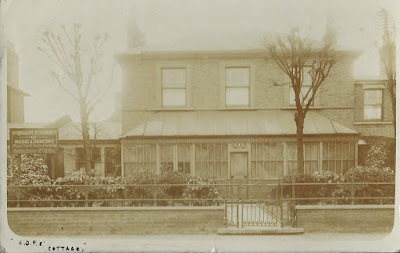 It was located on the site, currently being redeveloped by Mura estates on Earlham Grove, next to the Community Garden. See photo, below. 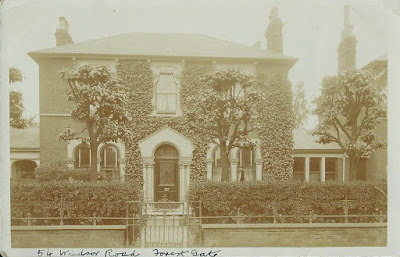 It remained the parish vicarage until 1950. 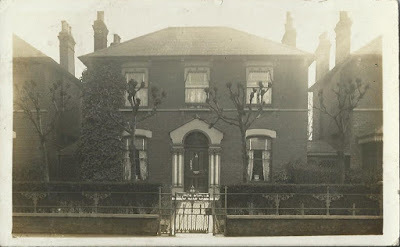 On completion, the vicarage was immediately deployed as a soup kitchen, during a particularly severe winter. This early version of a food bank gave out soup at 1d per quart, together with sacks of donated coal to poor local parishioners. 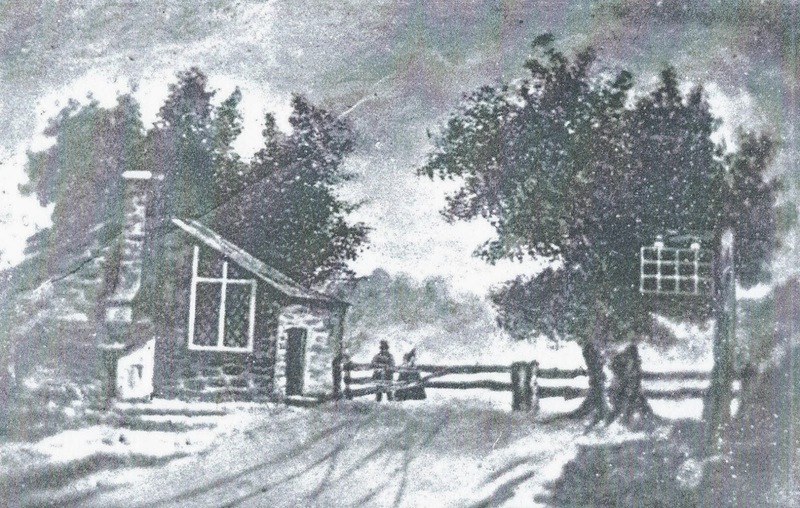 The soup kitchen was later moved to the grounds of Emmanuel school, and was in operation until 1883. 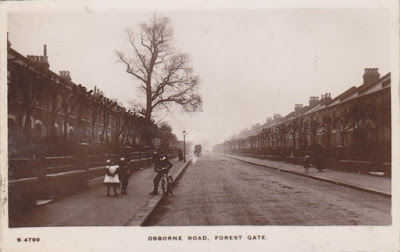 This was the time of maximum housing development in Forest Gate. By the 1880's the 500 seater church, designed by Gilbert Scott, was proving to be too small for the rapidly expanding congregation - and it was extended. - adding a further third to its eating capacity in 1886. Further expansions were objected to locally, as they would have meant disturbing the occupants of the graveyard! The Emmanuel Institute - the building on Romford Road, facing the church - was built in 1882, as a Sunday school and remained as a location for church events for 80 years before being rented, then sold, to Wag Bennett, as the weightlifting/bodybuilding gym, for which it subsequently became famous (see here and here for details). 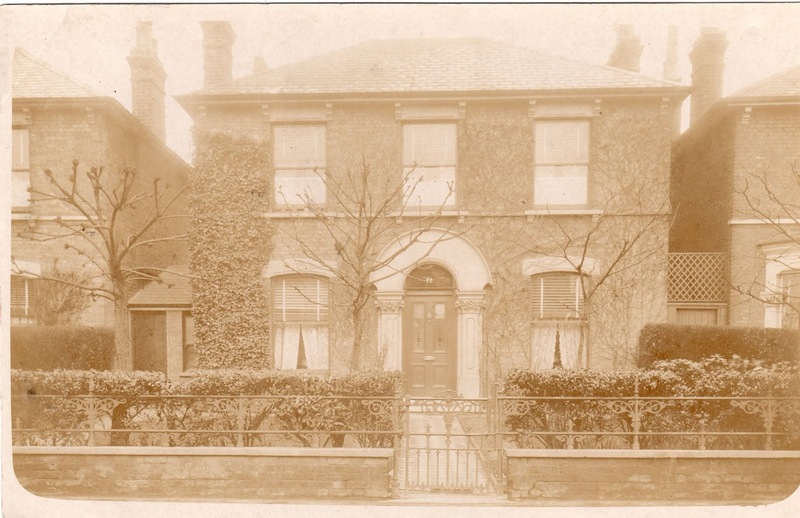 As a Sunday school, the building regularly attracted over 500 pupils, with 35 staff, in the 1880's. The land next to the Institute, also belonged to Emmanuel, which had unfulfilled plans to turn it into a library and a reading room. 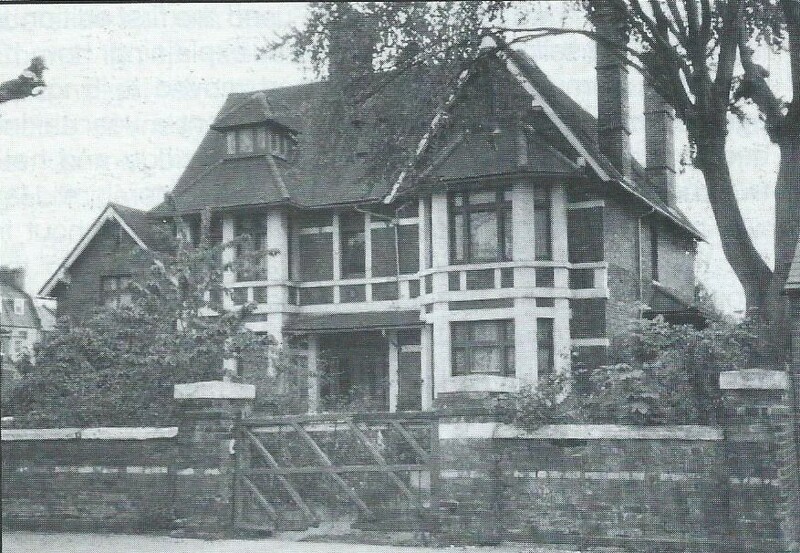 They didn't materialise, and for many years the space was occupied by a small garden centre and is now Ralph Jackson Court, a block of flats. 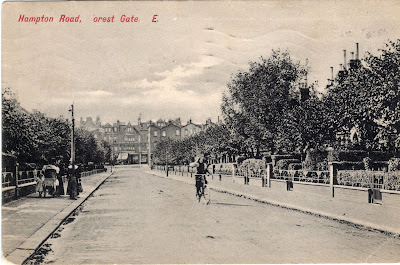 The Edwardian era (1901 - 1910) witnessed a boom in the use of picture postcards as 'social media', in the days before the introduction of domestic telephones. 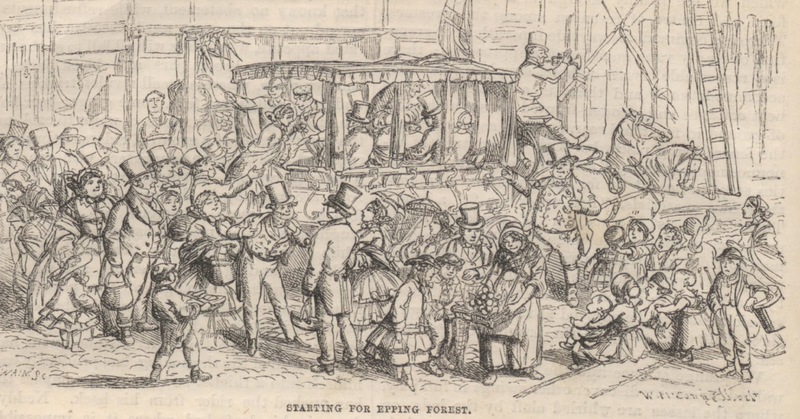 There would have been four or five postal deliveries a day, and people could conduct a correspondence about travel and meeting up arrangements, when visiting each other, for example, with the greatest of ease, over a few hours. 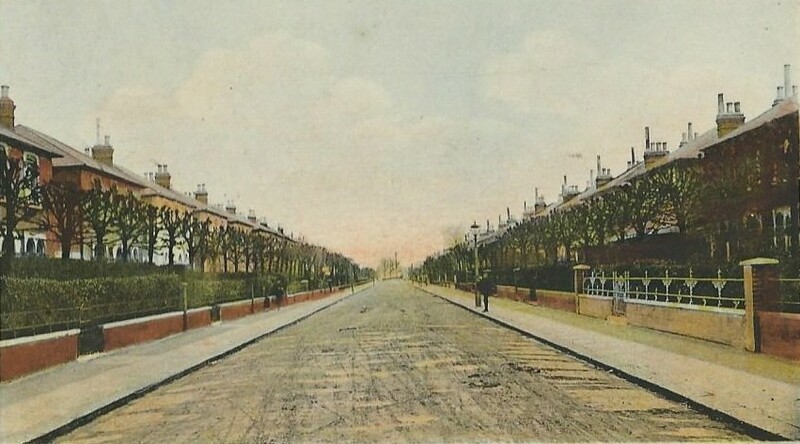 Among the most popular of the postcards were photos of prominent local streets, churches and parks. 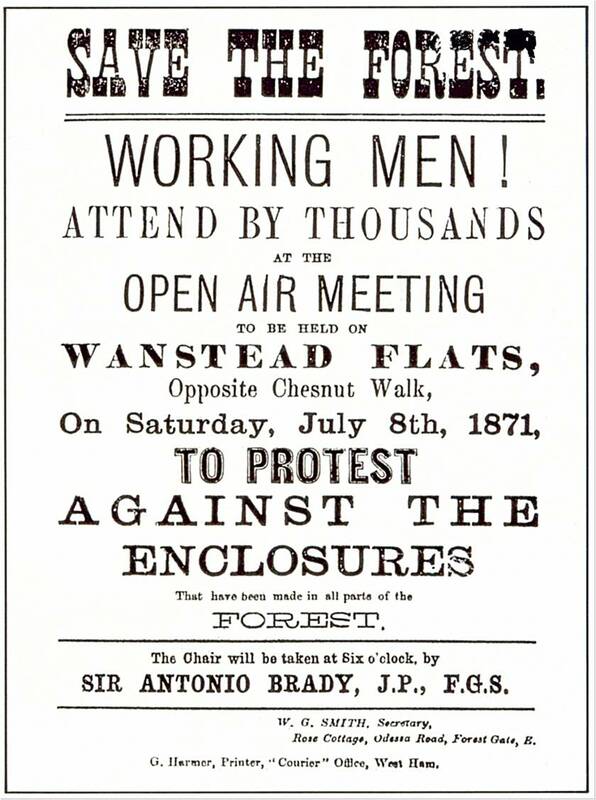 So, West Ham Park and Wanstead Flats are well represented, as are almost all local churches of the time. There are literally dozens of different surviving views of Woodgrange Road and small numbers of some local streets - usually the more prosperous (Earlham Grove, Capel Road, Chestnut Road being good examples). 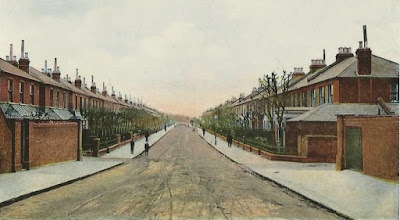 People used the postcards, employing the relatively recently developed use of mass reproduced photography, as a combination of a calling card and an illustration of their locality, or residence. 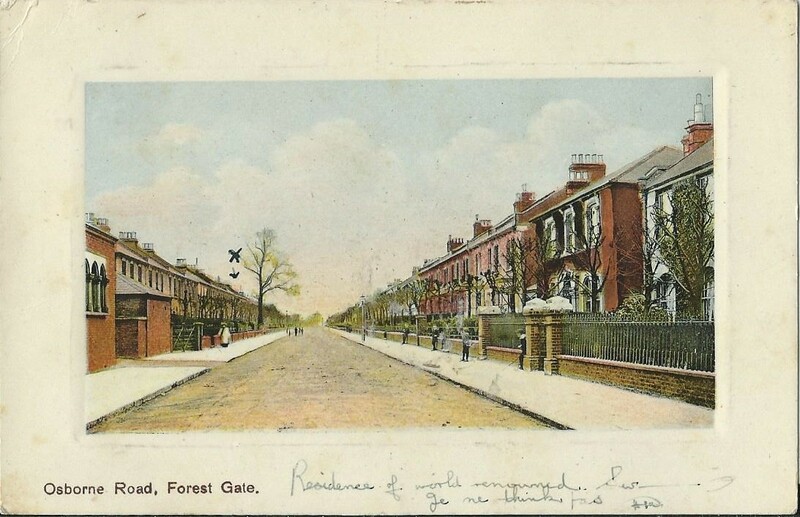 The streets of the Woodgrange estate are all well represented, and this article features a number of the postcards, which collectively inform our understanding of the development of the estate, as well as present a nostalgic glance back to a car-less era of wide, uncluttered roads. Many of the postcards of the era survive, and there is a busy, and increasingly expensive, market for them on E.Bay. 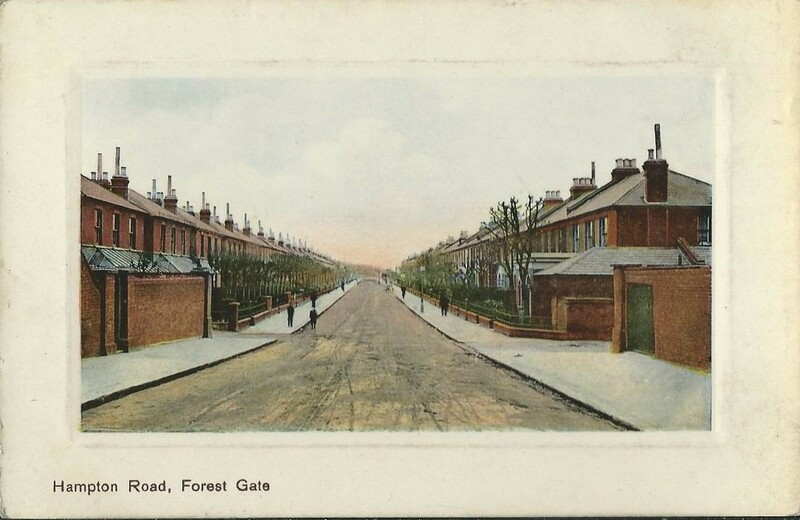 There are at least two local collectors of Forest Gate life, Tony Morrison, a friend of this site, and another equally valued contact, who wishes to remain anonymous. We are grateful to both for sharing relevant sections of their collection with us, so that we can display them in this article. 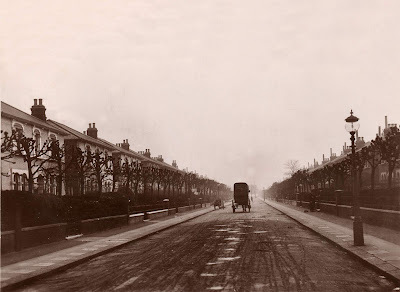 One rather splendid set survives of all four of the main roads on the estate. The photos are all hand-tinted and indented on high quality photographic paper/card, to give the appearance of a framed photograph. We reproduce the four- as a set - in minature, including their frames, here. We produce larger versions, without frames, so that the details can be examined more closely, in the separate road sections, below. 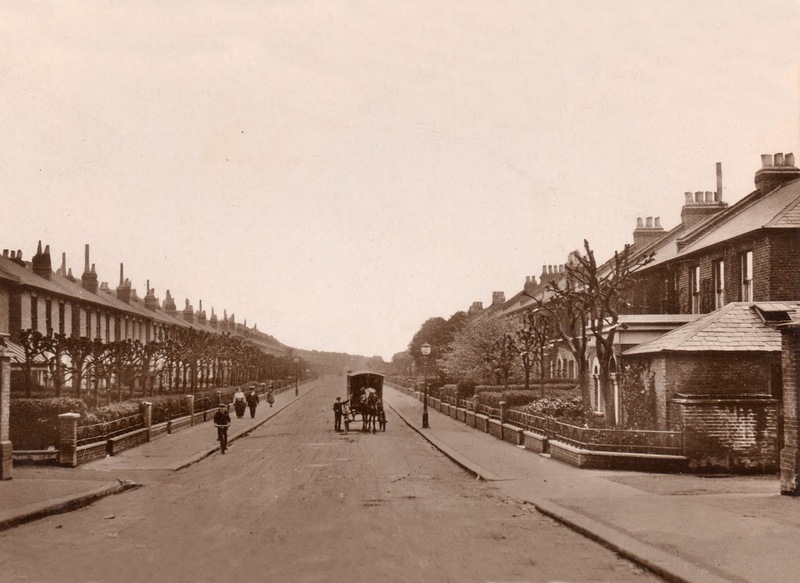 We are covering the main roads on the estate from south to north. 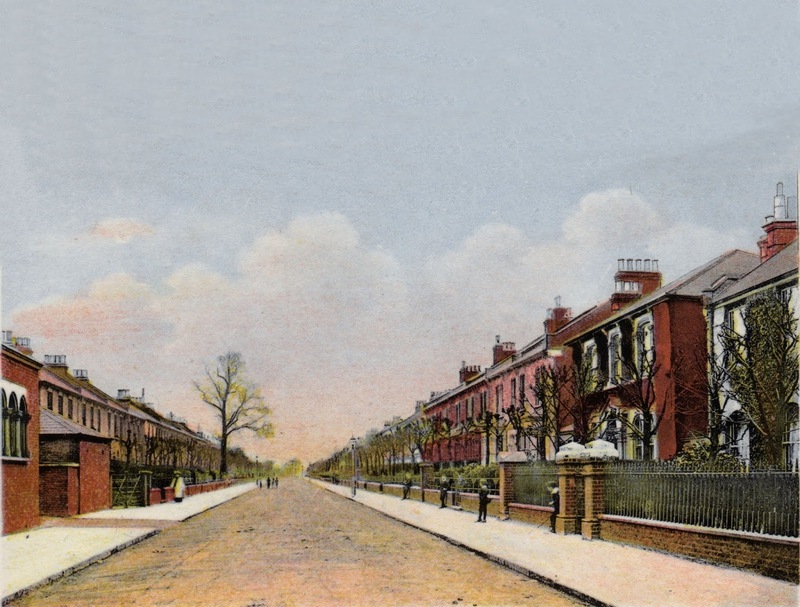 In very broad terms, that was sequence of grander to less grand houses in the estate, according to the surviving 1878 sales leaflet for the houses - see below. 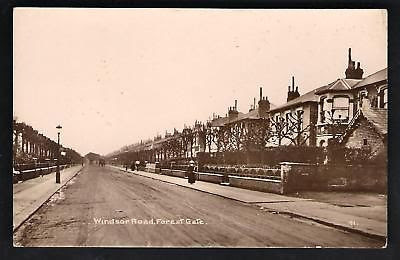 As the leaflet shows, the earliest houses on Windsor had the widest frontages (47 feet) and were most expensive (£590). 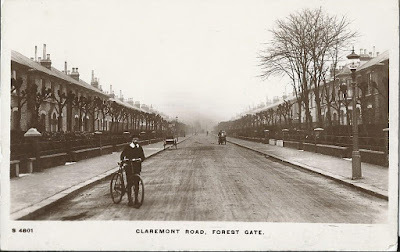 Then came those on Claremont (44 feet, £530), followed by Osborne and Hampton (both 39 feet and £490). It is those largest and most expensive houses on Windsor and Claremont that were bombed during WW2 and replaced by the 1950's estate. Below is a rare postcard of one of the largest of the original houses on the estate. 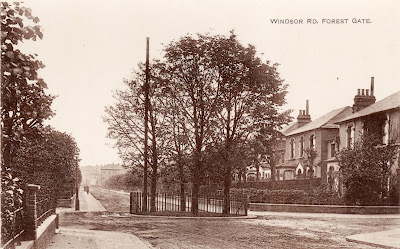 It is of 4 Windsor - with its 47 feet frontage. It is unusual in a number of regards. Firstly, as the sign on the far left indicates, it doubled up as a house and a Music and Dance Academy. Kelly's Directory of 1902 shows that it was occupied by "Madame Marian Finer, Professor of Music" and Thomas Owen Finer. The 1911 census shows the same couple, with a 25-year old daughter, Edith. It also suggests that Marion married Owen when she was just 16, and he 40, for in 1911 they were 45 and 70 respectively. The house has a conservatory at the front. 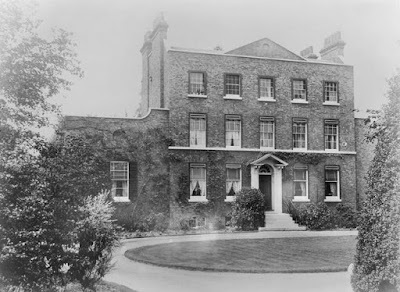 We have seen no evidence, photographically, or in writing of any other house on the estate having such a feature. 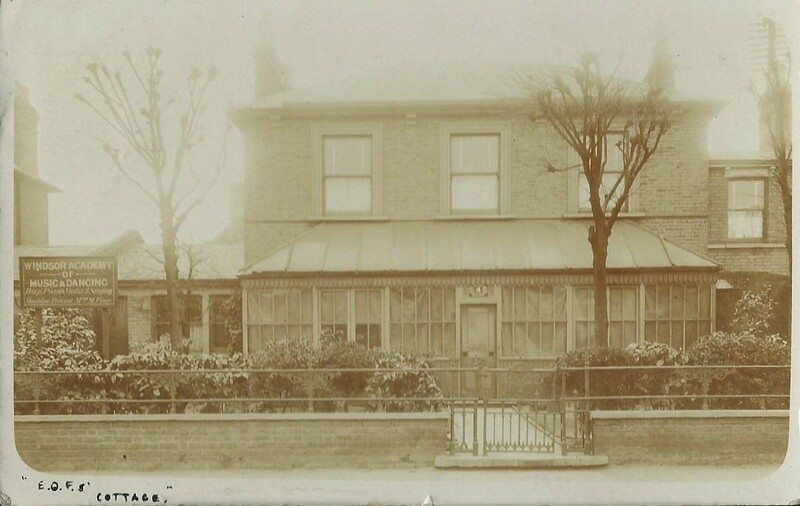 Many houses on the estate had verandahs - some of which survive - but none other, as far as we are aware, a fully enclosed glass frontage of the kind shown below. 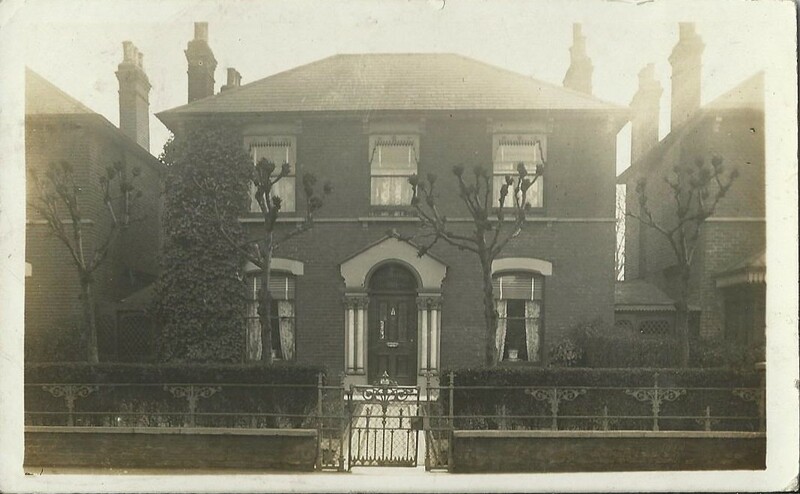 The photo suggests that the house was quadruple fronted, with an arch under the left hand extension leading either to the garden or perhaps to a coach house, at the rear. 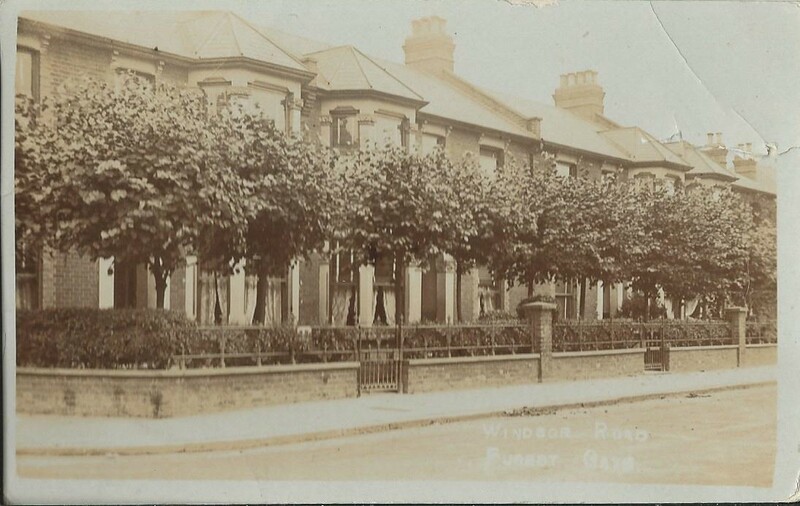 4 Windsor Road, in 1908. 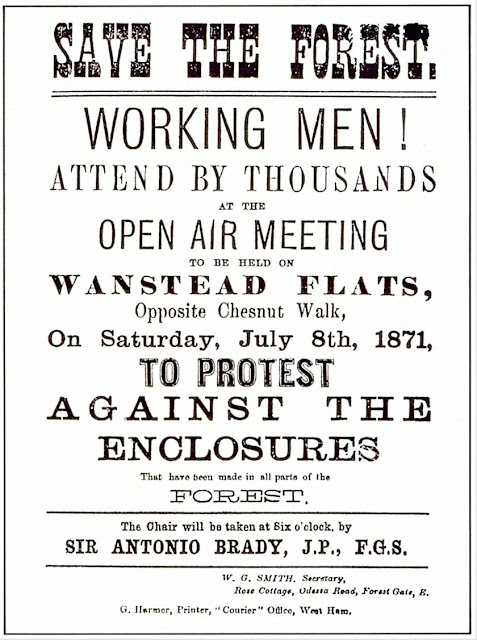 The sales leaflet, above, mentions the estate office. The manager was Mr Donald. This was located at 2 Hampton Road, and can be seen protruding from the fabric of the house in the postcard below. The estate office was important, for many years after the houses on the estate were constructed and sold. Most were sold on a leasehold basis - for 99 years, in the 1880's. 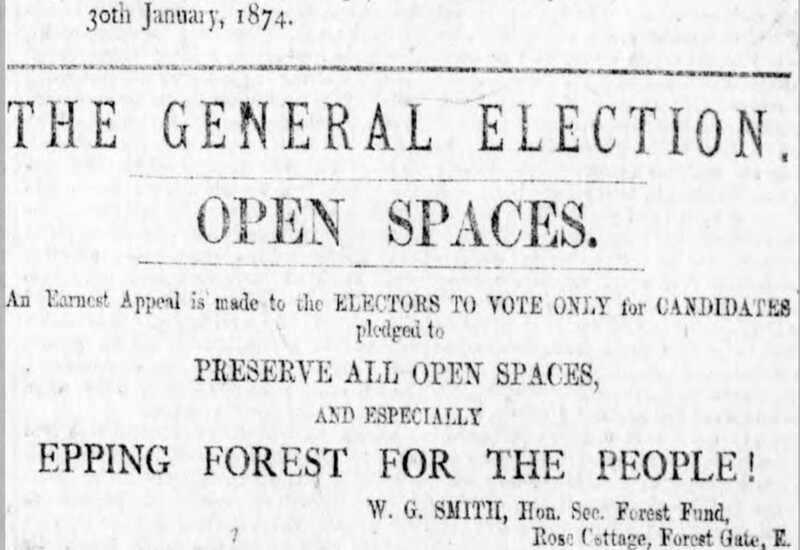 Others, as the leaflet suggests, were rented;. Those sold had a significant ground rent to pay each year. Corbett, the estate's developer, was fastidious about maintaining high standards on the Woodgrange estate. 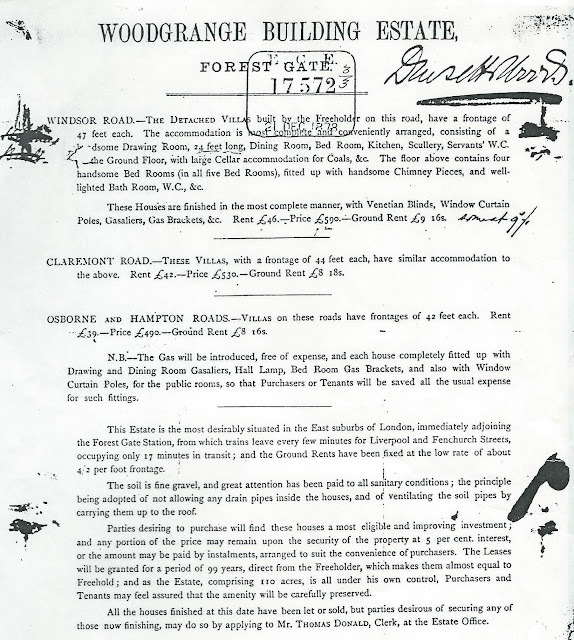 The original sales contract for the houses, for example, insisted that the purchaser kept the house in good repair, "and particularly will paint the external wood and ironwork in every Fourth year of the said term and the inside wood and ironwork in every Seventh year of the said term." Corbett reserved the right to inspect all houses that he had "sold" twice a year, to ensure that this was adhered to, and required any concerns to be addressed within three months. The Lessee ... will not make any alterations in the plan or elevation or in the architectural decorations of the said dwelling-house or any additions thereto or erect of build any new or additional building on any part of the said premises without the previous licensee in writing of the Lessor. 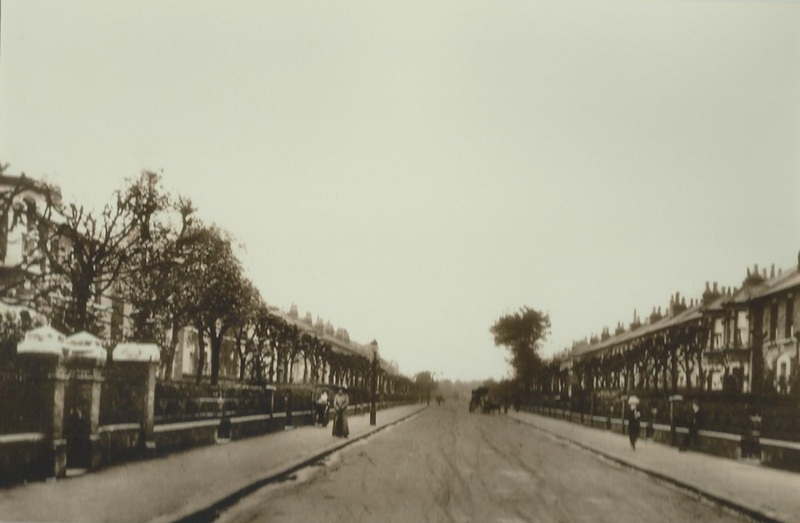 The upshot of the conditions imposed on the initial purchasers of houses on the estate was that conformity of high standards was enforced - through the estate office. 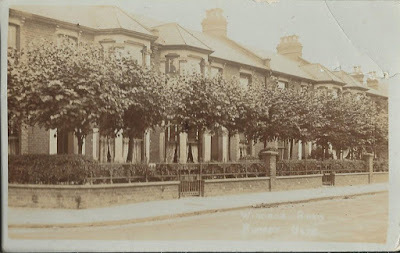 So, in many of the photos below, it will be clearly seen that the trees in gardens were pollarded and pruned together - to ensure a consistency and uniformity of appearance. Corbett began to sell the freehold of houses in the estate twenty five years after they were first erected - possibly to finance some of his ambitious housing schemes in south east London (see here, for details). It was only at that point that the owners were able to "individualise" their houses and make significant changes to their interiors, or exteriors. The postcards reproduced below, therefore, probably display the houses on the estate at their most uniform and mature - reflecting the kind of vision Corbett and his heirs had for the estate - neat, tidy, well-ordered and maintained to a consistently high standard. 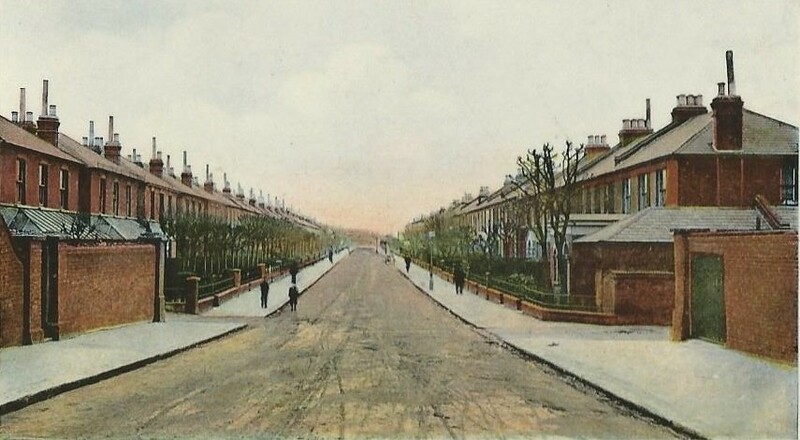 Road, above, in the postcard. Almost all of the postcards reproduced below are of the Edwardian era - as testified by the stamps and frank marks on the correspondence side of the card. Some are later, though difficult to date, if they have not been posted. 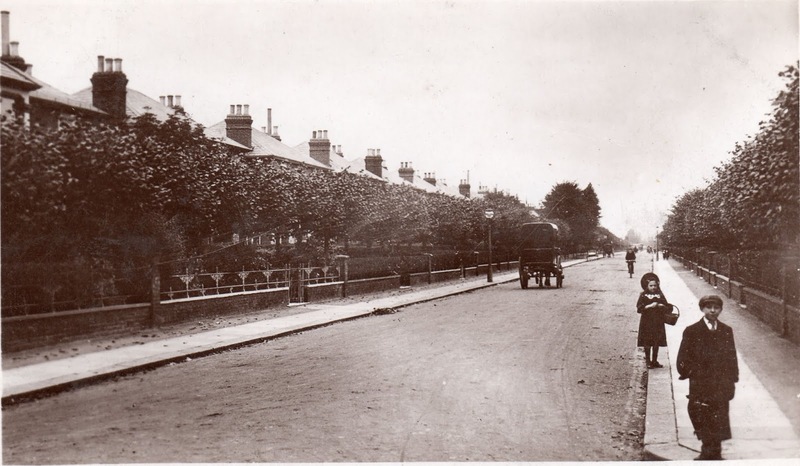 It is noticeable that all gardens hosted three or four trees, which were maintained by the freeholder. There were no trees on the pavements at this time - which taken together with the lack of traffic on the raods give the impression of wide, distinctive boulevards. 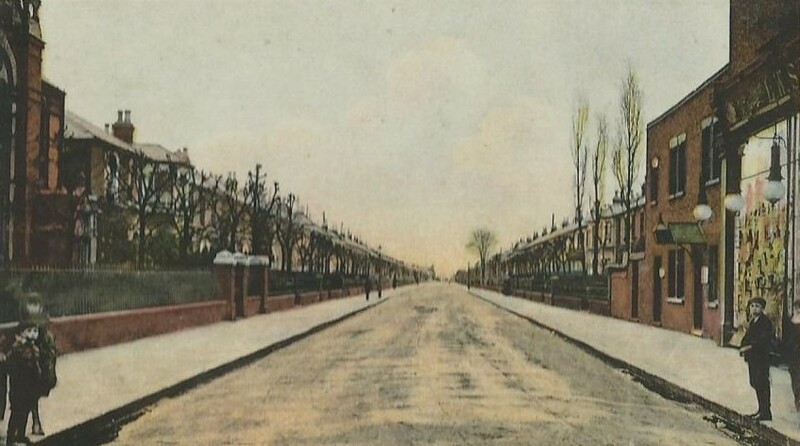 The approach in this article is to display general views of each street, as chronologically as possible, followed by rather more specific (sometimes single house) postcards. With these later cards we have, wherever possible, tried to produce a "now" version of the view today. In some cases the destruction of some of the original features of the houses makes for uncomfortable viewing. (Corbett) in the appearance of the estate. "right to buy" council properties in the 1980's? and used to help the war effort in WW2. 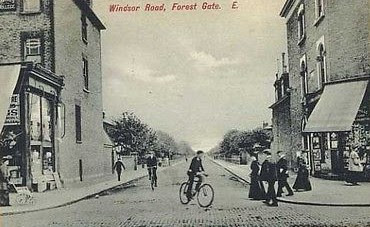 Above: Edwardian postcard of 54 Windsor Road. 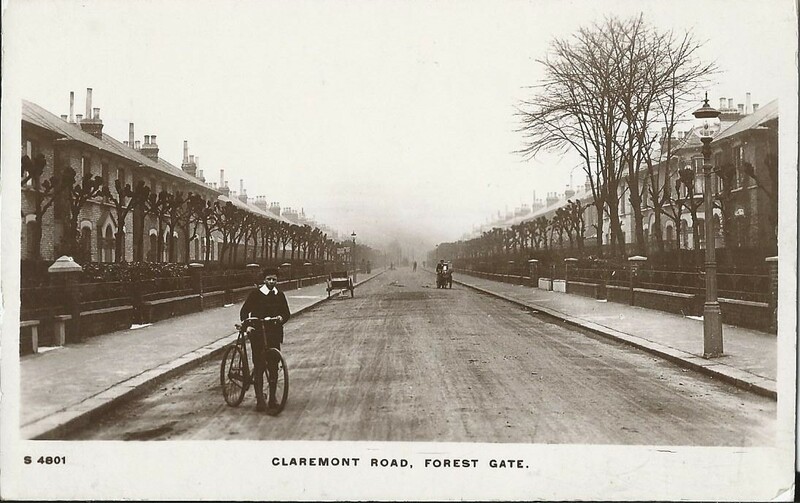 The Claremont card from the 1908 had-tinted set. pillars on the right were an entrance to the church. pre-bombed Methodist church on the left. winter. Below trees in full leaf, in the summer. but how few pedestrians there are, too. church - see above, for further evidence. 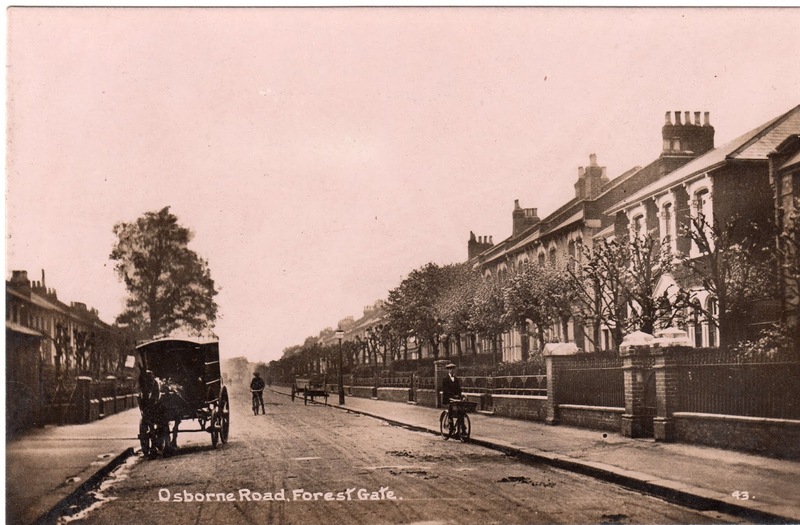 Fewer postcards seem to have survived of Osborne Road. The first two, below, have been taken from very similar positions. The red-tinted building on the far left is the side of what is now the Woodgrange Medical Practice, on Woodgrange Road. Immediately behind it is the end of a row of what were coach houses, or mews and are now an unsightly alley of garages. The white-capped pillars and taller iron fences on the left hand side are where Kay Rowe Nursery is today, and mirror those of the Methodist church entrance in Claremont Road, above. above, for others in the set. 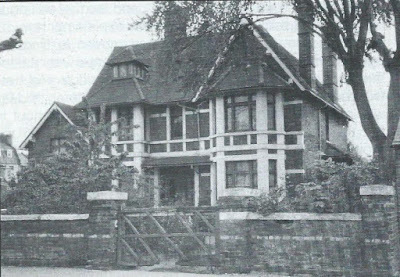 on right was the estate office - see text above. Above: 85 Hampton - then, and below, now. - hence the partial view. times, chimney stacks replaced by satellite dish.